The Milwaukee Bucks are shooting for higher things this season. 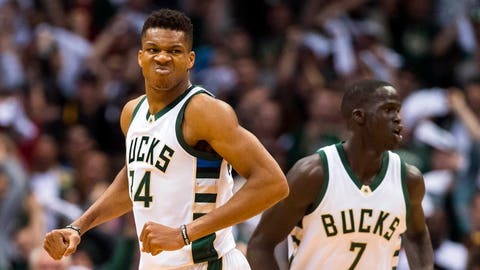 Coming off a playoff year but ousted in the opening round, the Bucks are off to a 4-2 start and six games in have a legitimate MVP candidate in Giannis Antetokounmpo. “The Greek Freak” has scored 28 or more points in each of Milwaukee’s games — no one has had a longer such streak to open a season since Shaquille O’Neal also did it in six straight games for Orlando to open the 1994-95 season. Only four other players have had a streak of six or more straight games with 28+ points since 1976-77 — Michael Jordan did it twice with the Bulls (streak of 10 and 9), Karl Malone had an eight-game streak in 1992-93 and Milwaukee’s own Marques Johnson did it in six straight in 1978-79. One reason for Antetokounmpo’s success in the early going is his proficiency in putting the ball in the basket. He’s shooting 63.1 percent from the field in the early going, setting a trend for the entire team. Milwaukee is shooting 49.3 percent from the field so far this season, a difference of +.019 from 2016-17, tying the Bucks for the third-largest field-goal percentage improvement in the NBA. Antetokounmpo doesn’t lead the Bucks in field-goal percentage, though. That honor belongs to John Henson, who is expected to see a bump in playing time with Greg Monroe out a couple of weeks, at 63.2 percent. Two other players are making more than half their shots — Tony Snell (51.2 percent) and Rashad Vaughn (57.1). Khris Middleton is off to somewhat of a rough start, converting just 41.5 percent of his shots. But Middleton’s presence on the floor has made a difference. When Middleton is on the court, the Bucks are shooting 51.9 percent from the field and averaging 112.7 points per 100 possessions. Without Middleton, those numbers dip to 41.3 percent and 87.3. Tuesday’s game against Oklahoma City will be a true test, however, as the Thunder at third in the NBA in opponent field-goal percentage (41.9).